Baseball has to be my least favorite sport. It’s looking like it might be Maly’s favorite. I can finally check “smoke a brisket” off of my bucket list. I have tried, for the past 6 years to smoke briskets, and all of my attempts have failed miserably. I invariably wind up with a dry and tough hunk of meat that I have to chop up and mix with barbecue sauce for chopped barbecue sandwiches in order to keep the whole process and purchase from being a complete waste of time and money. I like to consider myself a really good cook and over that past 15 years I have developed an in-depth comprehension and appreciation for the balance between the art and science involved in cooking. It’s become second nature for me to be able to plate a relatively intricate protein, sauce, starch and vegetable dish, timed perfectly so everything is at optimal temperature and nothing on the plate has died, fallen, broken, deflated, congealed, separated, et al. Smoking a brisket requires absolutely no sense of urgency, and I think that’s where I’d always fallen short in previous attempts. And smoking a brisket isn’t complicated once you get over the fact that it’s just not complicated. Before smoking my first brisket some 6 years ago, I did a lot of research. I got myself caught up in the science of smoking brisket. I tried to rig a complicated smoker out of an existing gas pit, tubing and terra cotta pots. When that wasn’t going to work, I bought a new grill with an indirect smoker box. Then when I tried to smoke the brisket, I thought I had to smoke the meat the whole time, which left us with what tasted like a large gummy ash tray. And I always cooked the brisket too long. I would buy a 4-5 lb. brisket and think that I had to cook it for 8-12 hours. This week I decided to try my hand at smoking a brisket again. This time, I decided to employee the expertise of the butcher at the local grocery store. I told him I wanted a small brisket to smoke. He took me to find a 4 lb. brisket and told me to cook it for a couple hours and to keep checking on it. I had a hard time regulating the smoker’s temperature, so I pulled the brisket, wrapped it in foil and stuck it in the crock pot at 200Â°F until the internal temperature of the brisket reached 190Â°F. I have long-known that proteins continue to cook after being removed from the heat source, but when I usually cook (especially over open fire) it’s so we can eat immediately. I’ll pull the meat from the grill, let it rest for 5-10 minutes and then serve. I’d done this with all of my previous briskets as well. I wasn’t letting them rest long enough (as in hours). After I turned off the crock pot, the brisket’s internal temperature continued to rise all the way to 212Â°F (next time I’ll remove the heat when the internal temperature reaches 180Â°F). Three hours later the brisket’s internal temperature was still at 130Â°F. What I ended up with was a moist and tender smoked brisket. FINALLY!!! I’ll spare the details and just say that this morning Maly took a pair of scissors to one of the blinds in our home office. I walked into the office just to check on her, and the first thing that I noticed were the blinds hanging oddly. Upon closer inspection, I noticed that one of the cords had been cut. I remembered Maly having a pair of scissors a few minutes prior, so it didn’t take long to put two-and-two together. She sheepishly nodded her head yes. With that, I stormed out of the office in fear of what I might actually say to my offspring should I had let my emotions get to me in the moment. I walked into the kitchen and told Elise what had happened. Maly got her fair share of tongue lashings from the both of us, but there was still a punishment to fit the crime to be determined. Luckily Elise had errands to run and Maly a play date, which allotted yours truly some time to figure out how this situation was going to get fixed. I steamed. I took the blinds down from the window and tried to fix them. I first tried to stitch them back together. That wasn’t going to work. Then I tried to “weld” the severed ends together with nylon string. At that point, my attempts to repair would end up costing more that just replacing the blinds. I thought about having the blinds professionally repaired, but that would probably cost close to just buying a new set of blinds. We were lucky in that she cut the cord of the least expensive blinds in the house. Before I’d even started shopping the replacement blinds, I decided that Maly was going to pay for the replacement. I’d figure out the details later. After a little shopping online, I found the exact width, length and style blinds for a replacement. With “order processing” and tax, the total came to $54.75, which might not ordinarily be a lot of money, but to us right now, it is, and there’s still the principle that needed to be addressed. When Elise and Maly returned from their respective outings for the morning, I showed Elise my repayment plan for Maly. She fully backed me on my plan and then sent Maly in to see me. Maly came into the office and I explained to her that I tried to repair the damage to the blinds. I told her that I decided to pay $54.75 for new blinds, and that she was going to have to repay me. I then sent her to her room to get her piggy bank and completely emptied it in front of her. Then I showed her the calendar I had created, which had jobs for her to do every day (not including school days on Tuesday and Thursday) for the next two weeks. She’s basically going to have to “earn” the money that had previously just been given to her. I put her money into my own mason jar and set it aside in my file cabinet. 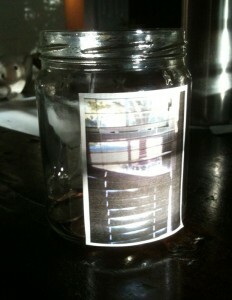 I took another old jar and taped a picture of the broken blinds to the front of it. For every job that she completes, she will have to come to me and I will pay her. She will then have to deposit her earnings into the jar for the new blinds. When I started creating her 2-week repayment calendar, I was trying to associate a dollar amount with every job that she performed. I don’t think she would really understand the value of a dollar over a quarter, or what $54.75 really looks like, so I omitted the commission value of her jobs. I will just pay her some loose change (after I “carefully” count out and pay the coins) for each job she performs so she can witness the stack of coins growing in her repayment jar. I don’t know if this is the right way to handle this situation, but it feels like it’s right by me. I don’t think punishing her by taking something away, putting her in time out, grounding or spanking her fits the crime. I think this is an opportune time to help her in understanding the value of hard work, money, communal property and consequences. I probably could have prevented this by paying a little more attention to Maly this morning. I think Elise and I could both tell that she was somewhat starved for our attention, and we got caught up in our own daily goings-on this morning. I think I also learned that this is all part of that circle of life thing. Elise’s and my parents are smiling heartily, and Elise and I, conscious of it are not, are glowingly awaiting becoming grandparents at some point down this ever-curving road of life. On Friday night Maly and I took our normal stroll to the mailbox (our neighborhood has community mailboxes a few blocks from our house); Maly rode her scooter as I walked. We decided to take the long way home by way of around the block. After we got the mail, I told Maly to ride her scooter all the way down the hill without putting her foot down. “Just ride it the whole way to the end of the street” I told her. As I watched her, the thought came to my head that she was ready to try riding her bike without training wheels. We’d talked about this new endeavor for a couple months, and I told her that it would take a lot of practice with lots of falling down and frustration. I was psyching her and myself up for for this challenge. When I saw how easily she balanced all the way down the street on her scooter, I just knew she was ready at that point, and I told her as much. And she excitedly accepted the challenge and the date to begin practice was set for this afternoon. And with that, I gave her a bag with her new bicycle helmet and pads. She ran inside and had Elise put her hair up in a pony tail and put her shoes on. She came back out to the garage where I helped her tie her shoes, put on her new elbow and knee pads and adjust her helmet. Then we took the wrench and removed her training wheels. We made a few practice runs on our street’s sidewalk and that’s about the time I realized that 1) I’m really out of shape and 2) I’m going to get in great shape if I have to run alongside this child without naturally extending my legs while holding the back of her bicycle seat so she doesn’t crash into the pavement. It was after those few runs that I decided it was time to just go ahead and start letting her go. She’d go five feet balancing on her own. Ten feet. Twenty feet. After a few minutes, I was measuring her distance from driveway to driveway. And soon, I just let her go and jogged alongside her so as to catch her if she start veering toward the street. And before I knew it, she was riding by herself all the way from our starting corner to our ending corner. What I’d thought (and psyched us both up to think) was going to take weeks only took approximately 45 minutes. Our baby girl proved to be a natural on two wheels. 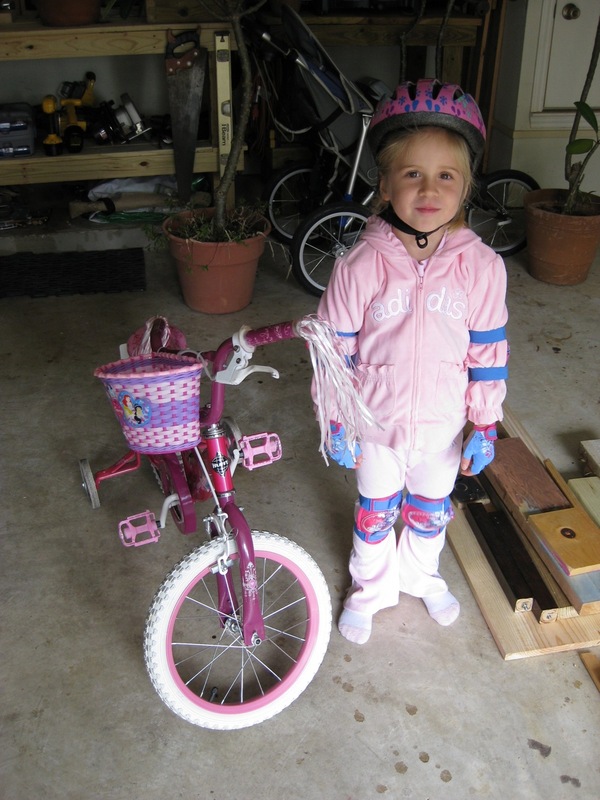 My original plan was to have her comfortably riding her bike on two wheels by the time she turned 5-years-old in 5 more months. Looks like I’m going to be teaching her bicycle tricks before Thanksgiving! Our friend Julie gave us a small, round table at a garage sale this past Saturday. Elise and I were both kind of eyeing the table, and it wasn’t until the end of the sale that we decided to run it across the street to see if we could repurpose this table, that once used to be a children’s activity table, into an end table for our living room. We decided it looked pretty good and would fit really well into our living room with a little touching up and raising it a couple inches. We offered to buy the table from Julie, but she wouldn’t let us. So we got the table at the friends and family discount. That afternoon, while looking at the table, I decided I would try to build a drawer for it. I jotted down what I thought I needed and Maly and I headed over to Home Depot. We bought a pine 1×12, a 1×4, a couple 1×3’s, a package of 2″ wood screws, a drawer pull, 2 packs of sandpaper, a 20″ drawer slide kit, 4 milled coffee table legs and some rubber glides for the bottoms of the table legs. All of these little things came to a total of $94.98. I first unscrewed the original legs and replaced them with my new milled legs and took the table from the garage and into the living room. Elise insisted that the table was too short. I lugged the table back into the garage and cut out 1.5″ block “risers” out of leftover lumber to give the table a lift kit to Elise’s specifications. After that I cut out the drawer facade from the existing frame, built a frame for the drawer, attached the drawer slides and then built a 2″ deep drawer (just to store our remotes). I woke up the next morning and spent the better part of the day sanding and refinishing. After a full-day’s worth of work and $95, we have a nice, new, “free” end table. Last month I gave our Mac mini a $10 internet speed boost by running CAT-5e through the attic and down a couple walls. Other than upgrading the RAM in my first iBook some seven years ago and the time I tore apart my terminal iMac just to see how it worked, I’ve never really tinkered with the guts of a Mac. I’ve long since wanted to upgrade the Mac mini’s RAM and hard drive but I’ve been hesitant because 1) the small form factor and 2) it’s a Mac (despite knowing that any computer’s hardware is just hardware that I’m intimately familiar with). After procrastinating for the better part of a year, I finally decided to upgrade the mini. I used Crucial’s Mac System Scanner to determine what kind of RAM limitations I had, and which RAM to purchase, and to find out what dimension SATA drive I needed to get. My Mac mini was the early-2009 Intel based model and would support up to 2GB of RAM and a recommended 5400 RPM SATA drive no taller than 9mm to allow for airflow. I found 2 1GB sticks of RAM for $39 and a 500GB drive for $55. This was an upgrade from 1GB RAM and a 120GB hard drive. I wanted to go for a 1TB or larger drive, but I couldn’t find one at 9mm in height. I did lots of research on how to upgrade a Mac mini and even though I have over 15 years experience in building PCs from the ground up, I was still a little intimidated and wanted to make sure I knew exactly what I was getting myself into. The best how-to article I found was “Maximizing your Mac mini” on Macworld.com. After reading that article, I was ready. 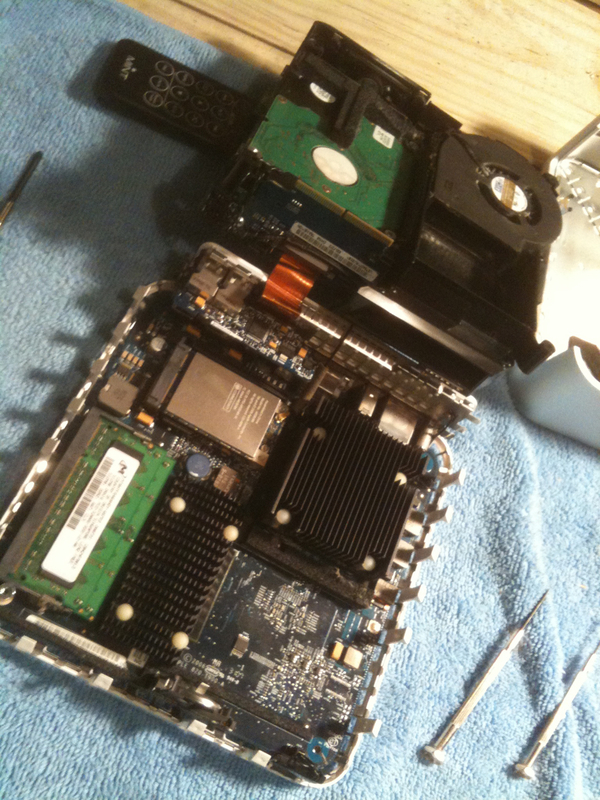 But first, I needed to clone the Mac mini’s existing hard drive onto the new 500GB hard drive. I found “How (and why) to clone your Mac hard drive” on CultofMac.com and began cloning the Mac mini’s drive. Thankfully I already had my handy USB 2.0 universal drive adapter, so I hooked up the new 500GB drive to the Mac mini as an external drive. Next I fired up Carbon Copy Cloner and after a couple clicks, I was making an exact, bootable clone of my existing Mac mini’s hard drive. This was new territory for me because in the past, whenever I upgraded the hard drive on a newly-built PC, I had a new PC, but I still had to install Windows, all of my programs, drivers, settings, etc. etc. The upgrade would be the easy part — the installations and getting system settings to where I wanted them to be was the painstaking and consuming part. When cloning the Mac drive, there’s nothing else that needs to be done – everything is exactly as it was on the old drive — right down to the desktop wallpaper and screensaver. It was a pain-free process to the point that I thought I had to be doing something wrong as nothing can be this simple when it comes to a hard drive upgrade. I was wrong… it’s that easy! I had to let Carbon Copy Cloner run overnight as I had over 100GB of data to clone. I woke up early the next morning, and just to make sure my new drive was cloned and bootable, I restarted the mini while holding the option key and selected the new drive from which to boot. I clicked around for 10 minutes just to make sure everything was working okay. Everything checked out okay. I had an exact, bootable clone on my new drive! I then re-read Macworld’s instructions on how to upgrade, and then I took the Mac mini out to my work bench in the garage, sat it atop a microfiber cloth and started prying and unscrewing screws. The actual upgrade was insanely simple and not worth my procrastination. I hooked the mini to it’s power source, the TV, ethernet and USB cables, clicked the power button and it booted up perfectly. I checked to make sure the RAM and new hard drive registered. Everything checked out! The only caveat was that I noticed the cooling fan was running continuously after the upgrade. I tried resetting the Power Management Unit and that didn’t do the trick. As a last resort, I disconnected the mini and took it apart again to find that I had neglected to reseat the fan controller when I was putting the mini back together. After reconnecting the mini, the fan stayed quiet and I had a newly upgraded Mac mini. Tonight Elise had a meeting at church, so I thought it would be a good idea to show Maly how to use the phone to dial either Elise’s or my cell phone in case she needs to get in touch with either one of us. I wrote down our phone numbers next to our names on a little piece of paper and taped the numbers to the refrigerator at Maly’s eye level. I showed her how to turn the cordless phone on, listen for the ringtone and then dial my cell phone number. It took her a few tries to finally punch in all of the numbers quickly enough to get the phone to dial, but when she did, it was like it was Christmas morning. She was so excited that she’d called my phone and was able to hear my voice on the other end, even though I was standing three feet away from her. And it was so cute the first six times. Now whenever she wants to talk to me, she calls my cell phone from the land line. I think I might have created a monster. Elise and I got up early on Saturday morning so Radek could take us to the metro station to catch our bus to NÃ¼rnberg. We exchanged hugs and lots of “thank you’s” and reminded Radek that he and his family are always welcome to stay with us when they come to Austin (which we’re hoping will be soon). And before we knew it, our luggage was loaded onto the bus and we were on our way headed west out of Prague. Three hours of slowly cruising through the Czech and eastern German countryside and while being subjected to the two ladies behind us complain about hot it was and how yummy the cookies were, we finally arrived in NÃ¼rnberg. Our flight out from Frankfurt wasn’t until Sunday morning, so we decided to stay in NÃ¼rnberg for a few hours instead of catching our scheduled train to Frankfurt. We walked into the train station and rescheduled our connecting train to Frankfurt with Deutsche Bahn, rented a locker to store our luggage and headed out on foot. We headed about as far north as time would allow us (we only had ~4 hours) and took a quick foot tour of the exterior of the Kaiserburg Castle, hauptmarkt and a hour tour of the toy museum (Spielzeugmuseum), which was probably my favorite part. We also stopped in at Das BratwursthÃ¤usle for some NÃ¼rnbergers (delicious finger-sized bratwurst) with potatoes, sauerkraut, rolls, pretzels and white wine mustard. We also did some souvenir and gift shopping and bought a bag of huge German gingerbread cookies (which puts those that us Americans are used to to shame). Four hours went by quickly and it was time for us to start heading back to the train station. We hopped on our train and again headed west toward Frankfurt. It was a slow-going train ride with lots of stops in between. Deutsche Bahn’s Intercity-Express (ICE) is so much nicer and faster than the commuter rail, which is what we took on the way into NÃ¼rnberg when we first arrived. Tired and ready to just get some sleep, we found a hotel near the train station, settled in and repacked our luggage for our flight the next morning. I don’t think we got to bed until 1 a.m. and had to wake up at 6 a.m. to catch the train to the Frankfurt airport. Four movies and 10 hours in the air and we were finally back in Texas. Customs was a breeze at DFW and we were soon in the car and headed back to Austin. We got home just in time to be greeted by Steve, Joanne and Maly, took our bags into the house and turned around to take Maly trick or treating in the neighborhood. Overall it was a great trip. I wish it could have been a little longer so we could have spent more time in Germany, but that’s just our excuse to go back some day. Photos from our last day of travel can be seen here.